In February we are working with Consider the Wldflwrs founder Emily Eggebrecht to learn basic/intermediate jewelry making techniques with a delicate 14k gold disc necklace as our sample project. Emily is a certified bench jeweler, certified stone setter, diamond specialist and floral stylist with a love of all things creative. You'll be diving into jewelry making for years to come after an incredibly informative, educational and fun February. In this workshop Emily carefully covers how to properly build this project's necklace from start to finish and covers topics such as wire wrapping, working with jump rings (the proper way), how to make jewelry repairs and how to craft with the tools and materials included in the February curated kit. 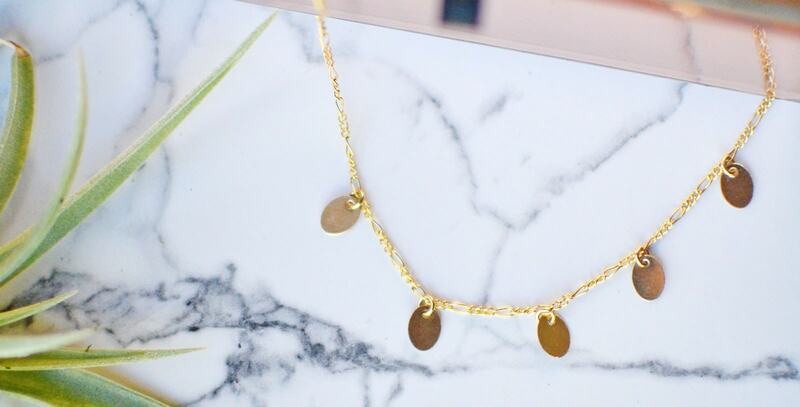 All of our jewelry findings, the chain and the small disc accents are made of 14k filled gold so that your finished piece is of incredibly high quality and will last. We are sending along three different jewelry pliers to follow along with Emily's various demonstrations as well as extra 14k gold wire for practicing and applying repairs to your own home jewelry box. Consider the Wldflwrs is an innovative jewelry company based in Nashville, Tennessee that specializes in using traditional metalsmithing techniques to create simple everyday pieces as well as heirloom bridal jewelry. Emily shares with us that she first moved to Nashville in 2010 to pursue music and quickly discovered that she enjoyed the design side of her music passion (building her website, decorating her merchandise table) more than performing. She began Consider the Wldflwrs in 2013 as a self-taught designer, photographer and jeweler. Over the past three and a half years Emily has fallen more in love with metal, design and jewelry as well as teaching her craft. She enjoys working with youth in non-profit programs and a small group of ladies in Honduras on how to do the same techniques that she shares in this workshop! Find Emily on Instagram here and learn more about Consider the Wldflwrs here.